You are here: Home Genn John What is a Devic Temple Crystal? Let's start with the description. Crystals which have Fairy Frost, Mirror Fractures and Rainbows inside are called (by some*) Devic Temple crystals. Devic Temple crystals are described as having "special places for Light Beings to reside". * I feel all crystals have this ability/inclination so I tend to shy away from this term. The term Devic Temple, then, is a little bit misleading. This implies that only the crystals labeled as Devic Temple have the ability to harbor or house Light Beings. It is included here as a separate blog post because it is a popular search term and you might be looking for more information on this type of crystal. 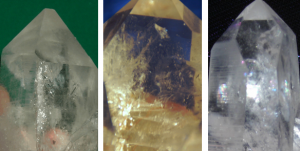 According to some, Devic Temple crystals are considered to be "Master Crystals". However, to me, the term Master Crystal is arbitrary and subject to interpretation. The Crystal People are ALL masters. Also, the list of Master crystals varies fairly widely according to which author you read. Therefore I am not a big fan of lumping the crystals onto a "Master Crystal" list. That being said, I will address Master Crystals in more detail in another blog post and we'll get back to Devic Temple crystals. WHAT DOES A DEVIC TEMPLE LOOK LIKE? Very often, the crystals I see online described as Devic Temple have tons of Mirror Fractures caused by stress, called "crazing". 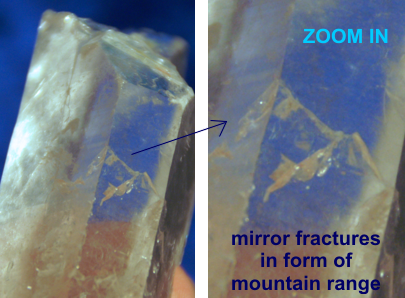 Crazing is when lots of Mirror Fractures are created when the crystal undergoes a shock such as a sudden temperature change. A hot crystal into cold water or cold crystal into hot water, for example. These Mirror Fractures tend to go completely through the crystal. They traverse side to side and cause the structure of the crystal to be prone to breaking more easily. The crystals which I tend to call Devic Temple often have less Mirror Fractures than the other examples you might find online. 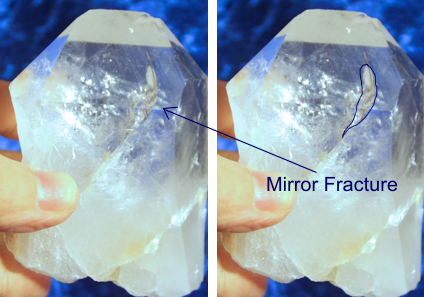 The Mirror Fractures often take shapes and tend to be more internalized (less to the far outer surface of the crystal). There is also a lot of ethereal looking Fairy Frost and Rainbows added into the mix. Initially the term Fairy Frost might make you think of something on the outer surface of a crystal (frost on the pumpkin, frost on the ground), however it isn't. Fairy Frost occurs only inside the crystal. Crystals with Fairy Frost have fractures and inclusions of air within them. The trapped air is wispy, white and fairy-looking. Some are more fairy-like than others. If it helps you to visualize, I would compare Fairy Frost more to our working definition of "fog" than "frost". Many crystals have Fairy Frost, in fact more of them have it than don't have it. A crystal without any Fairy Frost at all, with no fractures or inclusions inside, is called optically clear or water clear. Crystals with Fairy Frost are sometimes called "Devic", because they can connect us to Nature Spirits or Deva. Because of this description, I can understand how some crystals with Fairy Frost came to be called Devic Temple crystals. But why not all? My take on this coming up. 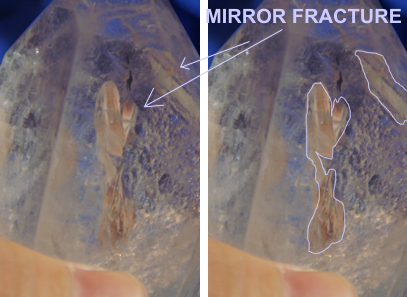 Very often, along with the Fairy Frost there are internal fractures called Mirror Fractures. They are shiny and silvery and look like mirrors inside the crystal. They often have Rainbows on them. Very often you will see shapes and images in crystals that others don't. This doesn't mean the shape is only in your imagination (isn't real), oftentimes crystals will show something to a person that is a special message for them. Mirror Fractures may often present in shapes. Fairies, women, faces, mountains etc (pictures below). MY GUESS ON HOW THESE CRYSTALS BECAME KNOWN AS "DEVIC TEMPLE"
My guess is that the term Devic Temple came into being when people saw crystals with lots of the wispy Fairy Frost inside. Next add the magic of Mirror Fractures (which can look like little shelves or seats, and even figures and people). Finally, the Rainbows added a special glimmer and magic to the whole mix, voila, Devic Temple! 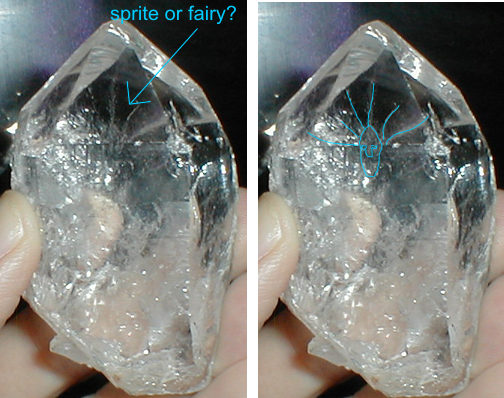 Now, don't get me wrong here, I am not implying that the crystals DON'T have Fairies, Deva and Angels within. I am just suggesting that these crystals termed Devic Temple aren't the ONLY crystals which have this special feature. On the subject of Devic Temple crystals, or crystals given that name: we see ALL naming of crystals as a human construct. We are ALL able to house Deva, and do that which the 'other' has been touted as being Masters of. The naming does help to give humans a jumping off point. This is both due to the visual nature of the crystal and the human need for tangible prompts to help to experience non-visual phenomena. To explain, when a person sees a crystal with what appears to be shelves or seats, they can more easily imagine a Light Being sitting there. The "Devic Temple" crystals tend to have more intricate insides and interesting shapes to follow with your imagination, which gets you out of your mental, looking-for-proof minds. In this way, it is easier to experience the actual feeling of that Light Being. The Being, more accurately, can be called upon to visit through the crystalline structure. The same is true with crystals with certain shapes on the insides (the "Fairies", "Angels", "faces" and "shapes" one might identify). The being itself might have altered the internal look of the crystal to give the person a clue that they are available to interact. To further clarify what Venus said so eloquently above, I see the shapes of Beings not as a Being "trapped" inside the crystal, but more of a "calling card" to connect to the Being through the crystal. I think it is part of why I shy away from the term Devic Temple in general. In the description of a Devic Temple, the implication is that the Light Being resides inside the crystal or is trapped there. I don't see it this way at all. Not to forget, there is also the consciousness of the Crystal Being itself that is present (accessible) in every crystal. More on crystalline consciousness here - (talking about crystal names and descriptions) and here - (talking about "Spirit Beings" in crystal). Depending on the crystal, and whether the Fairy Frost or Mirror Fractures represent something to us (Mountain or Earth Spirits, Fairies, Angels, Sprites, etc) we may work with that particular energy. The wispy Frost and Mirror Fractures inside crystal is also something that draws us in, causes us to look for shapes and messages, scenes and landscapes. It's like a world inside a world. A natural snow globe. In this way, crystals with Fairy Frost (which admittedly is the majority of crystals) will connect us with nature, as it sometimes appears like fog we see outside, and with Fairies (etc), as it sometimes takes the shape of them. Take a look at these crystal photos from my archives. 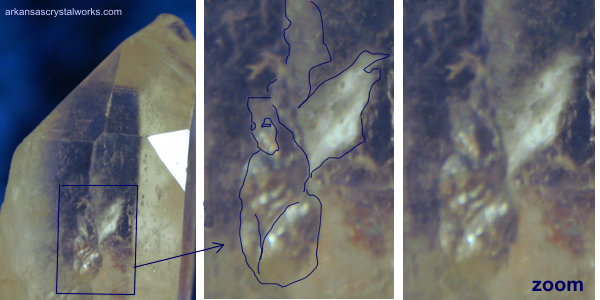 I have outlined or zoomed in on a few of the things I saw in the crystal. If you take a look, it is very likely that you may see even more. Angel or Fairy, her legs look almost crossed, head resting on one knee, hands in her lap, maybe holding something. Does she have a reindeer horn? Is she sitting under mistletoe!? If you look at the zoom in without the outline, she looks much more serene than my scribbled drawing, which was done with a mouse, so it's not so great). The outline should just give you an area in which to focus to see the being (as is true with the following pictures as well). Also, don't let my outlining distract you from other Beings you might see in the same picture. Just because I didn't outline it, doesn't mean it is not there. A beautiful grouping of Mirror Fractures which look just like a mountain range to me. This is an example of a Sigil. Sigils are usually described as occurring on the outside surface of a crystal, but the definition of a Sigil is applicable to scenes and messages appearing inside the crystal as well. This little grouping of Mirror Fractures looks like a lot of different things to me. I initially outlined it just as an example of what a Mirror Fracture is, I wasn't outlining a particular shape (though I see a few now). Take a look and maybe you will see a story play out. In this little wisp of a Mirror Fracture, I see much more than what I initially outlined. Again, I was just outlining the Mirror Fracture (not a particular shape or Being). However, I see arms and hands on this little Mirror Fracture, my arrow in the photo would be pointing at it's rear. I see it is maybe holding a cat (with glowing eyes). The Being appears to be curled over the kitty and the Being is looking down at it lovingly. The kitty looks at us. This guy needs no commentary (but look, I gave you some anyway!). Look at his hair! Again, the outlining doesn't accurately outline the expression on his face, just gives you an area in which to look. Looking at the photo without the outline, you can see some real mischievous emotion in that little Being. One eyebrow is raised and the other down low over the other eye. It is why I say maybe a Sprite. Impish, playful and old. It is not surprising to me that I drew the outline to look like Kilroy, as he appears to be peeking out from behind a wall of sorts. Brilliant! Ok! That is all the pictures I have for right now. Thanks for taking this journey with me, discussing Devic Temple crystals. Remember that all crystals have the ability ascribed to Devic Temple crystals. Sometimes you will see a shape or Being in a photograph but are unable to find the same Being in the physical crystal once you get it home. This is not unusual at all. If you feel so led, I would continue to connect with the Being in the crystal (knowing it was in the photo) even if you can't "find" it in the physical crystal. If you recall, seeing the Being in the photo is just a calling card that the Being is available for contact, not necessarily the Being itself. Perhaps this will inspire you to look more deeply into the crystals which live with you (whether labelled Devic Temple or not) to see if there is a calling card from a Being who might like to connect with you!